Grace Kelly -- no small part of Monaco's gorgeous scenery. 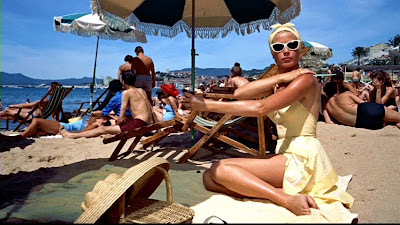 Shot mostly on location as a "gorgeous spectacle in VistaVision," To Catch a Thief offers up panoramic views of Monaco, tours of its famously narrow, precipitous roads other beautiful scenes. It’s a travel pic. 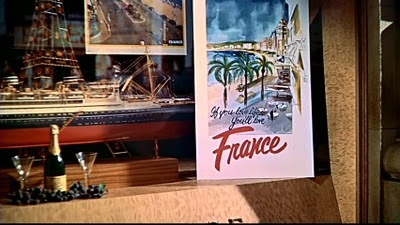 And just to drive the point home, the film introduces the principality with a travel agency poster with its jaunty slogan "If you love life, you’ll love France!" For most people, this film is the next best thing to actually traveling to that resort city, and it's escapist entertainment at its best. But an escape to what? A vacation spot? Hardly. It’s just an illusion. An image on a blank screen. The very next shot after the travel poster comes as a self-reflexive shock -- it surprises, but isn't it also exacrlt what Hitchcock's audience would expect? Alfred Hitchcock delivered that illusion using the best Hollywood tricks and technology at his disposal. And then he set about subverting it. By means of his traditional cameo appearance, the film’s references to Cary Grant’s offscreen life and Grant’s mugging asides to the camera, this film reminded audiences that it’s only a movie. In an earlier post, I described Hitch's films as "philosophical treatises, written with a camera, not a pen." I’d like to modify that. I don’t think his films are treatises as much as they are philosophical meditations. His movies aren’t so pedantic as to try to convince people of any philosophical position; instead, they mull their subjects over, leaving any conclusions open-ended, up to the viewer to decide upon. TCaT ponders the nature of identity – traded in, replaced, inhabited and eschewed. 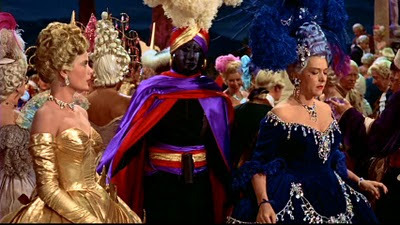 The theme of identity and the many masks it wears reaches its logical conclusion at the masquerade ball, when H. H. Hughson (John Williams) literally effaces his persona and is mistaken for John Robie (Cary Grant). Perhaps his triple H initials -- which could also link him to the director -- are there to signify the three identities he takes on. Just as decisively as Archibald Leach traded in his name for the more saleable moniker Cary Grant, that actor also replaced his identity as a circus acrobat with that of a suave leading man. Likewise, his character, John Robie, The Cat, traded in his criminal past for a new life as a gentleman bachelor and vineyard owner. Almost no one in TCaT is what they seem to be. The good guys are busy trying to hide their humble origins behind a veneer of wealth and sophistication, while the bad guys are rapidly amassing wealth while posing as wage-earning restaurant workers. 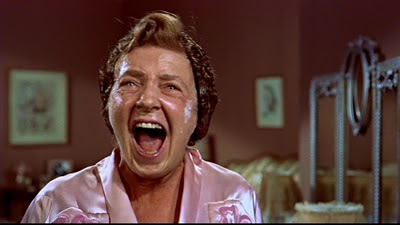 This idea of identity recurs in Hitchcock’s films. In fact, part of what makes his movies so damned compelling is that there is an ongoing, coherent set of themes that continue from one film to the next. (Now, that’s continuity!) Stick with me here. I promise to wrap these thoughts up in one more – and, I promise, final – post.